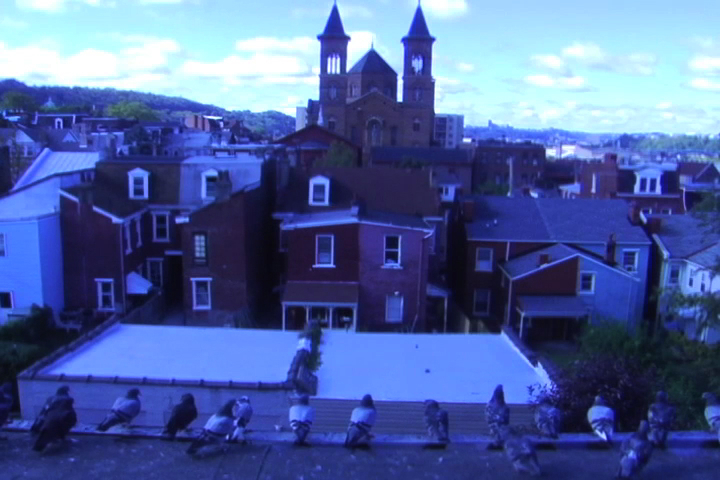 Footage of flocking pigeons in Pittsburgh, PA were altered, the digital video files manipulated, and edited using formal filmmaking techniques. This clip is a five minute segment of the third channel of the installation. Installation built for 3 screens, each exhibiting the same 90-minute loop started at different time codes in the video. Experimental process artist Jessica Fenlon earned her MFA at the School of the Museum of Fine Arts, Boston in 2002 after completing her BFA at the University of Wisconsin-Madison. She spent eight years making experimental cross-media, digital, performance, video, & installation art in Pittsburgh, Pennsylvania. Since moving to Chicago, Illinois she focuses on glitch-based digital image alteration as source material for her work. She began screening her work internationally in 2012.